White Gold Sapphire, White Diamond and Black Diamond Trilogy Engagement Ring — Form Bespoke Jewellers Ltd.
A unique trilogy engagement ring with a white diamond, black diamond and sapphire. 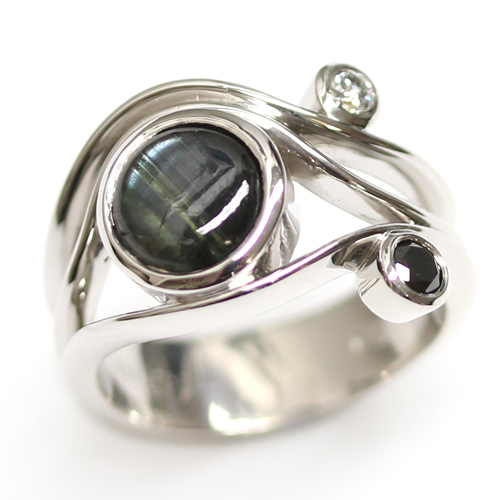 The customer designed a bespoke engagement ring for their partner that included a wave detail and a trilogy of coloured precious stones. Their design was recreated on CAD so that they could see a 3D virtual image of their engagement ring. Once they were happy with all the details, it was sent to the casters to be cast in white gold. A selection of precious gemstones were sourced for the customer, to match their requirements. It was up to them to choose which gemstone they would like for their bespoke trilogy design. They decided upon a round brilliant cut white diamond, a round brilliant cut black diamond and a round cabochon dark sapphire. All three stones were rub set by hand into the white gold engagement ring and the ring was hand finished and polished in our Leeds workshop.